Before I get into my rambles about cataloging news, I’d like to salute Jim Coombs at Missouri State, who has put together a “new and expanded” 43-map index to the current LC G Schedule, reproduced elsewhere in this issue of the WAML IB. I don’t know about you but, with Jim’s permission, I plan to send it to my public services colleagues for their edification and delectation, and I’m going to keep a copy of it nearby to help me quickly recollect the classification number ranges for the US regions and states. Thanks, Jim! The main highlight of recent months for me was the ALA Annual Conference, held June 26-30 in San Francisco, and much of the news in this column was gleaned from meetings, events, and presentations in the beautiful (and unseasonably warm!) Bay Area. On a personal note, beginning after ALA Annual, I now serve as Vice-Chair of MAGIRT (the Map and Geospatial Information Round Table of ALA), which is a wonderful opportunity for me to work more closely with many map library and GIS colleagues. I’m looking forward to an exciting year (and more deadlines, ha ha) ahead! In the Rare Materials area, the Descriptive Cataloging of Rare Materials (Cartographic) (DCRM(C)) has had a close reading and the editors are now dealing with the comments. The final approval by the RBMS Bibliographic Standards Committee is hoped for by the end of the year. According to Nancy Kandoian (Map Cataloger, New York Public Library), DCRM(C) can be used to describe any rare cartographic material of any age or type of production; in other words, any special materials, as distinguished from regular by your institution. In comparison with standard map cataloging (per Cartographic Materials), there is more emphasis on exact transcription, slightly different prescribed sources of information, and guidance on hand coloring, among other differences. There are also some very useful specialized appendices along with an expanded glossary. You may view the latest draft of the standard in the DCRM(C) Wiki: http://dcrmc.pbworks.com/w/page/34637799/General%20Information. The Library of Congress Geography and Maps Division (G&M) is continuing its work on a new map cataloging manual, which will include LC-specific policies and the “best practices” for cartographic cataloging being developed by MAGIRT. At this point they have finished reviewing most chapters and are working on appendixes on special and historical treatment, and so on. Depending on workload and special projects such as BIBFRAME training, they hope to complete the manual by ALA Midwinter (January 2016). They encourage other institutions to adopt local policies as needed, since this manual describes only LC policies. Most 20th and 21st century resources will not receive any additional access points (beyond the primary person or organization responsible for creation of the resource). They have been cautious in assigning relationship designators, and do not think that “cartographer” should always be the one to use; they lean toward using “creator” when there is no explicit statement of responsibility. However, they do assign “cartographer” for all national and military mapping bodies, unless other information states otherwise. For genre headings, they do not assign “maps” to records for atlases because it is not very useful. MARC Update #20 (April 2015) will be implemented by OCLC later this year, probably in August. The changes are listed here: http://www.loc.gov/marc/bibliographic/bdapndxg.html One general change is that for fixed field 008/28, university press publications were removed as examples of government publications. A new field 884 has been added, “Description Conversion Information,” that will “provide information about the origin of a MARC record which has been converted by machine from another metadata structure.” This can record technical information about Bibframe structures that are converted into MARC records, for example. Phase 3b involves 7.4 million records, so the task group will attempt to extract the entire authority file, process it, and replace the entire file. If this works, it must be completed before Oct. 1, 2015 due to budgeting, and the file will be offline for at least one week. If this does not work, the plan will be to work through the file 30,000 records at a time. As a result of the April 2015 RDA Toolkit update, many of the relationship designators formerly in Appendix J are now in Appendix M, entitled “Relationship Designators: Subject Relationships.” The use of subject relationships is specified in RDA Chapter 23. According to the LC/PCC policy statement, you may use these designators in $i of a 7XX added entry field or a 7XX linking entry field, or incorporated into a note. However, they cannot be used in 6XX fields at this time. Catalogers must still need to do subject analysis for LCSH, because these relationship designators do not replace LCSH. My current favorite random map, from the National Library of Australia. Greece is shown as an “irritating crab,” hmmm. I’d love to see a modern interpretation in the same style as this map! 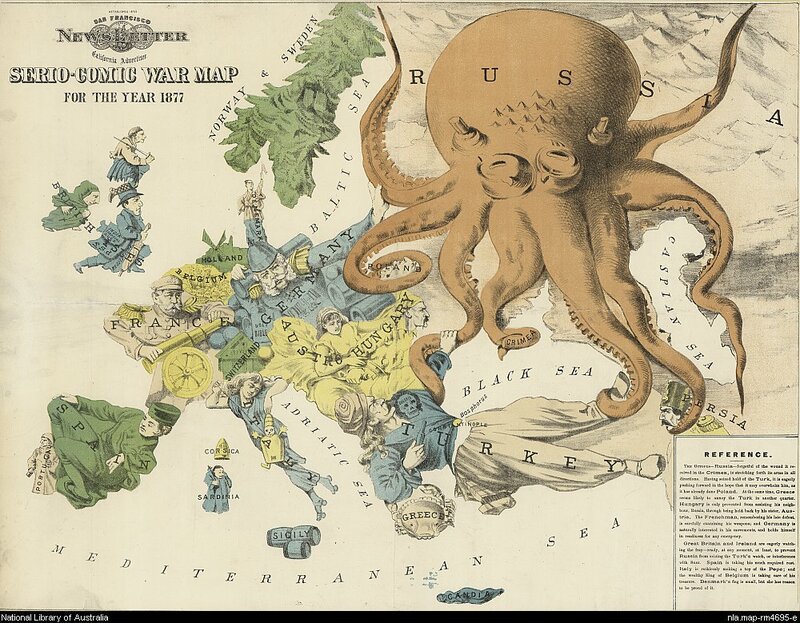 Notes: The map shows the political situation in Europe in 1877, Russia – a vicious-looking Octopus – its eight lengthy tentacles extending into Northern and Eastern Europe, the Middle East and Asia, encircling in tightening strangle-holds the territories of Finland, Poland, Bulgaria, the Crimea and Persia and even reaching as far as the Holy Land, Armenia and Khiva in Central Asia. The Turkish Empire, in the form of a prostrate turbaned figure lying across the Dardanelles and Bosphorus, pistol at the ready, protects his prize gold watch, Constantinople, which hangs around his waist. Greece, an irritating crab, pinches his right elbow. Hungary is held back from attacking Russia by his sister Austria. Germany, in the form of its uniformed Emperor, surrounds itself with arms and weaponry, ready for any emergency. France in the form of Marshal MacMahon, points a dangerous mitrailleuse at its German neighbour, eager to avenge its defeat in the Franco-Prussian war of 1870-71. Italy is a young girl enjoying her newly found liberty, the Papal crown located in Rome. Spain is the reclining figure of Alfonso, sleeping after his recent exertions. The King of Belgium surrounds himself with his treasure. Denmark waves her small flag proudly. The British Isles, England a kneeling gentleman umbrella at the ready, Scotland a kilted highlander with claymore raised, and Ireland a hooded monk with Home Rule on his mind, stand on the sidelines determined at least to save the Turk’s watch. Sweden stands aloof in the North as a fur-clad woodcutter. Relief shown pictorially.